Last week I posted about a farewell to Norway found written on a barn beam. The man loved his homeplace, and clearly mourned leaving it. That reminded me of something penned by another immigrant. While researching Scottish settlers who arrived in North Carolina colony prior to and during the American Revolution, I found almost no written records. Certainly some early Scots prospered. 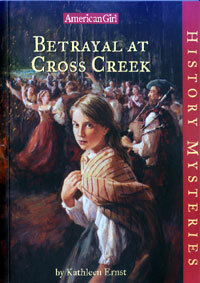 My fictional family in Betrayal at Cross Creek, though, represented many poor farmfolk who spoke Gaelic, and for whom a diary or even pen and paper for letters would represent a luxury. One of my favorite books (of those I've written). The new environment those Scots found was a trial. People used to open heaths found land available in the deep pine forests near present-day Fayetteville. The dense canopy, the wolves and wildcats, and the isolation of the scattered farms were overwhelming. with wolves and beast howling in every cranny. We’re ruined since we left King George. 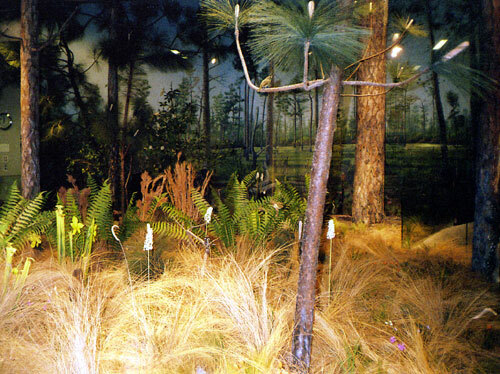 This depiction of the longleaf pine forest is actually a museum recreation. I had a hard time finding this landscape. The deep forests of longleaf pine are all but gone, and urban development has long-since paved over those tiny farms. I finally got a glimpse of McRae’s world by visiting Fort Bragg. That sprawling military base has preserved not only remnants of the ecosystem, but a few early churches as well. Archaeological work is underway, helping historians understand more about the vanished communities. One of the churches on Fort Bragg. 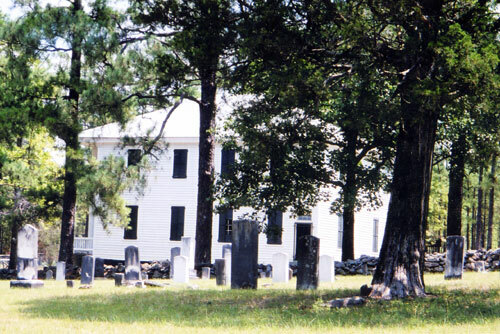 The building doesn't date to the colonial era, but the congregation and some of the gravestones do. And these trees are longleaf pines. I’m enormously grateful that a tiny scrap of that natural and cultural landscape has been preserved. Nothing, though, speaks as poignantly of an early immigrant’s grief over their own lost sense of place as McRae’s words. This entry was posted on February 8, 2012 at 2:44 pm and is filed under Betrayal at Cross Creek. You can follow any responses to this entry through the RSS 2.0 feed. You can leave a response, or trackback from your own site. What a lovely blog and yet sad. It had to be very hard to leave a home you loved and find yourself in an area that was foreign, strange and dangerous. Pioneer stories aren’t all excitement and discovery, and I’m glad you found a way to show that.